Jackie Slater played in the Southwestern Athletic Conference All-Star Game three times, and in his senior year at Jackson State, he was named a Pittsburgh Courier Black College Football All-American First Team Offensive Lineman. Slater was invited to play in the perennial College All-Star Football Classic, which pitted the best of college football senior players against the National Football League champions. Jackie was a third round pick of the Los Angeles Rams in the ‘76 NFL Draft. He played in 259 consecutive games from 1976 o 1995, setting a record for an offensive lineman. In 1983, Slater helped Dickerson set a rookie rushing record of 1808 yards. He was inducted into the Jackson State, SWAC and Pro Football Halls of Fame. Robinson enjoyed one of the finest coaching careers in sports history and was one of the greatest leaders the game ever saw. His success embodied a pivotal times in the evolution of Black college football. 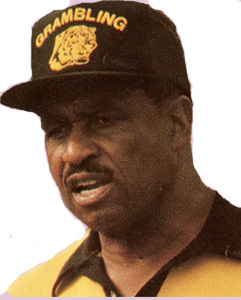 Robinson spent 56 years (1941-1997) at Grambling State University and made unprecedented moves by taking his teams on the road to big city stadiums and helped introduce Black College football to the world. He won his 408th game on October 11, 1997 (26-13 over Mississippi Valley) and became the winning-est coach in the history of college football. 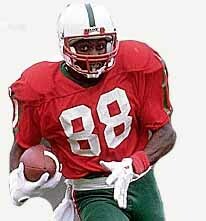 Jerry Rice set out on a stellar career when he joined the Mississippi Valley State Delta Devils under head coach Archie Cooley. Cooley had a flamboyant style and his teams reflected it…and it was the perfect system for Rice to display his superior talent, bouyed by a hard working ethic and a lot of discipline not usually embraced by such a young player. But by the time he left ‘Valley, he had established himself as one of the best wide receivers to play the college game. The consensus All-American set career and NCAA highs with 301 catches for 4,693 yards and 50 touchdowns. Rice made his pro debut with the 49ers and gradually worked his way into the starting lineup…and as they say, the rest IS history. Wa lter Payton joined his older brother Eddie on the football team at Jackson State after being snubbed by the more powerful SEC and other major conferences. By the time he left, he had a career worhty of a statue on campus. Not only did he lead his team and the SWAC in rushing, he set a scoring record (65 TDs) (unofficial at the time) and rushed for more than 3,500 yards, averaging 6.1 yards per carry. In 1972, Walter set a then-best SWAC scoring record by scoring 7 touchdowns and running for two points (for 46 points) as Jackson State crushed Lane College, 72-0. In 1973, Payton was named an All-American and the Black College Player of the Year in 1974. Payton graduated in 1975 with a Bachelor’s degree in Communications. The Chicago Bears selected him with the fourth overall pick in the 1975 NFL Draft. He had his breakoout game in the final game of the season when he rushed for 134 yards on 20 carries and made major strides every season aferwards, becoming one of the poremier runningbacks in the NFL. He was an annual selection to the Pro Bowls, earning MVP honors in 1977. Payton rushed for a career 16,726 yards, 110 touchdowns, caught 492 passes for 4,538 yards and 15 touchdowns. He set several team records, including most career rushing yards, receptions, touchdowns, and touchdown passes by a running back. Payton’s jersey number was retired by the Bears, and he was inducted into the Pro Football Hall of Fame in 1993.